Continuing to EVOLVE and Make our Mark! Every company has a story to tell. To some degree, Blast is similar to other businesses that have persevered and grown into stable, successful, and growing enterprises. But in many ways, Blast is unlike any other. Read on for a historical timeline and perspective of our unique, data-driven, and people-led company — and how we continue to EVOLVE. In March 1999, Kayden Kelly left his position as marketing intern for Sacramento Municipal Utility District (SMUD) to become a Wall Street investor and fund manager. To buy him time while obtaining his licensing, he started a small web design consulting company — a gig he enjoyed so much that he shifted course to pursue the dream of building his own company full-time. He did so not merely for financial gain, but driven by a genuine goal to provide quality solutions for clients, collaborate with industry-leading partners, and create opportunities for employees and their families. Blast Design Studio was born with Kelly as its lone employee performing website maintenance and analytics analysis for his previous employer, SMUD. Operating in the enclosed patio of Kelly’s 150-year-old, 450-square-foot rustic home in Auburn, California, and financed by a handful of personal credit cards, Blast was just getting started, facing the typical challenges of any sole proprietorship. Against skepticism that he was “underfunded” and “wouldn’t make it,” Kelly was even more motivated to prove otherwise. Establishing credibility with SMUD and recognized for its value as a website consultant, Blast landed “word of mouth” contracts with several new clients, including Wells Fargo, HP, and Kaiser Permanente. In addition website design, interactive design, and hosting, the company began offering custom programming (i.e., eCommerce, CMS and custom applications), search engine optimization (SEO), pay-per-click (PPC) advertising, and user experience (UX). 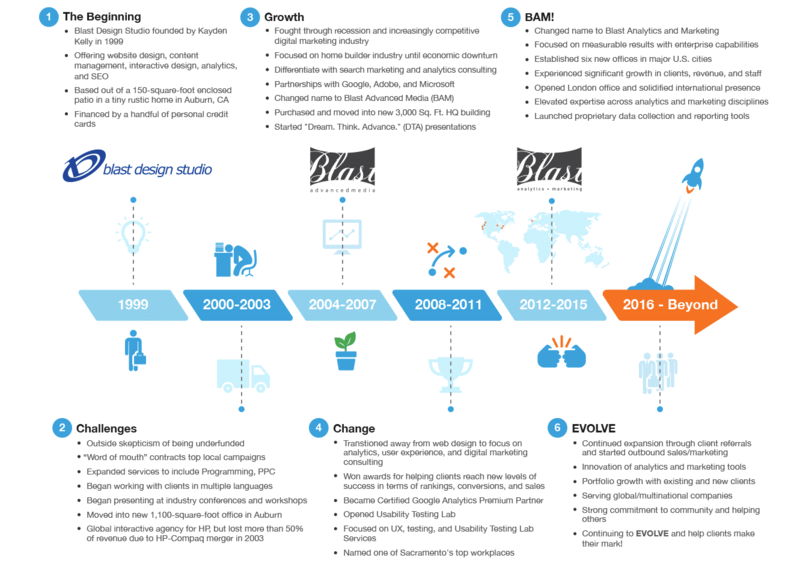 Through a partnership with HP worldwide, Blast became a “global” interactive agency and began establishing key relationships with international contractors. The company also began presenting at various industry conferences and workshops, sharing its expertise specifically around SEO, analytics, and user experience — with a focus on the “customer journey.” By 2001, Kelly had moved Blast from his house to a 1,100-square-foot office in Auburn. Not long after, Blast (along with many consultants) was significantly impacted by the HP-Compaq merger, losing nearly half its business. Showing its resiliency, the company still finished that year “flat,” while moving into content management system and ecommerce development. Despite the recession of the early 2000s, Blast held its own in the increasingly competitive digital marketing industry. The company succeeded with an emphasis on home builders, until another economic downturn negatively impacted this industry — and thus, Blast’s business. With web design work becoming commoditized, Blast started to offer conversion optimization testing services and focused more on search marketing and analytics, as a way to bring unique, value-added expertise to clients that were seeking to grow their online presence. At the same time, the company strategically aligned itself with key partner technologies, including Google Analytics, Adobe Analytics, and Microsoft, among others. This enabled Blast to further help clients gain knowledge and insights from their data for smarter decision making and more purposeful action. With renewed focus and growth, the company changed its name to Blast Advanced Media (BAM) and then purchased and moved into a new 3,000-square-foot headquarters building in Roseville. In 2007, Blast established its internal “Dream. Think. Advance” (DTA) presentation program, designed to share knowledge and expertise across the company. Kelly made the strategic decision to fully separate Blast from web design and focus on analytics and digital marketing consulting — a move that immediately paid off. As just one example of its success, Blast helped a global customer increase its conversions 591%, leading to a 70% increase in web-based sales. (To this day, the case study is shared on the industry speaking circuit.) The company further pushed forward internationally working with clients in various languages, including Dutch, French, German, Hebrew, Italian, Japanese, Portuguese, and Spanish. Additionally, the company expanded its relationships with Google, becoming a certified Google Analytics Premium Reseller Partner in 2011. With a continued focus on user experience and interaction design services, Blast also opened its Usability Test Lab, providing a critical service to clients seeking to enhance their user experiences. With a growing staff, Blast was establishing a fun and friendly yet focused work environment that resulted in the company being named one of the Sacramento Business Journal’s “top workplaces for micro-sized businesses” in 2008 and 2010, as well as one of its “healthiest employers” in 2011). Changing its name to Blast Analytics and Marketing in 2013, the company not only kept the BAM!, but also aligned its brand with its core services. Inspired to make even greater business impacts, Blast focused on delivering measurable results (e.g., 174% SEO growth for an international client) and expanding its enterprise consulting capabilities. Working with diverse clients across the U.S., Blast established offices in San Francisco, Los Angeles, Seattle, Chicago, New York, and Boston. This national expansion brought about several new opportunities with clients and partners, as well as the hiring of more analytics and marketing consultants. Blast’s presence abroad grew further, with speaking engagements at the renowned Search Marketing Expo in London, the opening of a London office, and the subsequent hiring of additional international talent. Working with a range of B2B and B2C companies, Blast continued to build out its service offerings, adding elevated expertise in business analytics, data visualization, marketing automation, content strategy, and other areas. The company also developed and launched proprietary data collection and reporting tools ClickStreamr and Unsampler. A respected industry leader, Blast continues to expand our business analytics and digital marketing services through client referrals and initiating outbound sales and marketing efforts. We also continue to develop innovative tools, such as an analytics maturity assessment with benchmarking and roadmap capabilities to help clients evolve their analytics maturity. We are scaling our people, services (e.g., personalization), processes, and systems to further grow our portfolio of business with both existing and new clients, including several multinational companies and brands. The company has 40 employees — all driven to make our mark on our clients, our industry, our communities, and each other — with conservative plans to double both staff and revenue by 2018, focusing on major U.S. markets such as San Francisco, as well as the United Kingdom.